Something for Everyone - Upgrade to Mimosa Today! For a limited time, now through October 15th, 2018, buy Mimosa radios in any of the combinations below and receive two C5c radios! Upgrade your backhaul network today with the industry’s most cost-effective backhaul solution. *Offer valid 9/1/2018 through 10/15/2018. 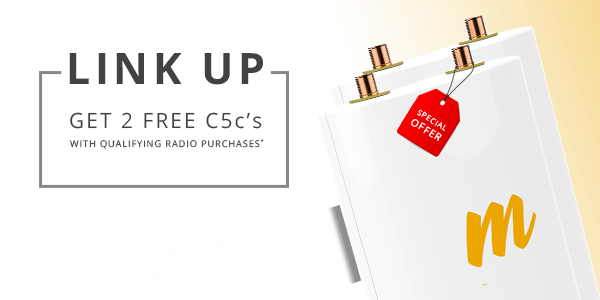 Purchase qualifying radios as listed above and receive (2) C5c radios at no additional cost (excluding shipping). Available via participating partners only. Verify partner participation before purchase. Cannot be combined with other offers or discounts. Void where prohibited, taxed or restricted.